Can you do me a favor, and just delete this application...No rip off characters...Hei is pushing it as it is...The only reason I'm okay with him is because apparently Ricky said it was okay. And even with that, I still find problems with all the new applications. Just do me and yourself a favor, scrap this idea. Plus Sannin are stronger or as strong as a Kage. 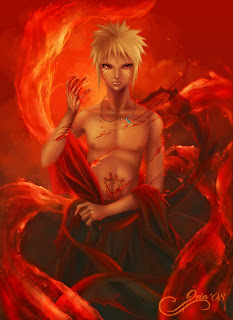 Mkay, I'm gonna just say approved...he seems like Gaara, but with lava...So it shouldn't be a problem. But he can't be Sanin strength, Jounin strength is fine...That's what every character Adult character excluding Higure should be at. No, not approved. Lava Release is already a Kekkei, you can't have another Kekkei on top of it. Basically you have 2 kekkei genkai, no. Lol, No I didn't look at it...Sorry, bout that guys...Usually I do much better at looking over apps, but lately I've been a tad bit stressed out. Everyone makes mistakes and as far as I can see this is your first one...don't worry about it Ralph.